In Search of PVT HUMPHRIES?? ten short days later he left for boot camp at Ft. Ord, California. At the end of my dad's first week of boot camp, PVT. 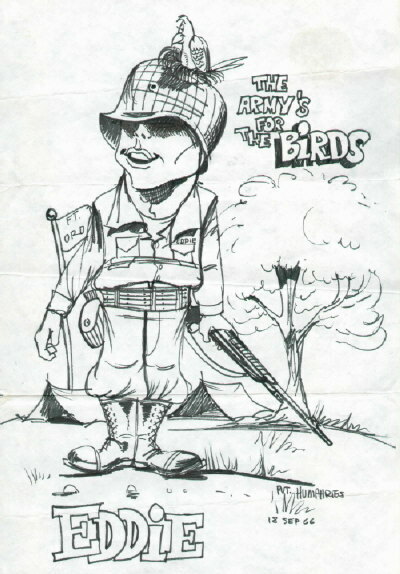 Humphries drew this caricature. My father promoted to the rank of Sergeant (E5) and was Killed in action on May 5, 1968. His name is forever engraved on Panel 55E Line 6 of the Vietnam Veterans Memorial. PVT. Humphries drew of young boys who were sent to battle. There are 5 Humphries on the Vietnam Veterans Memorial, could he be one? PVT HUMPRIES...If you are out there?